W.A. 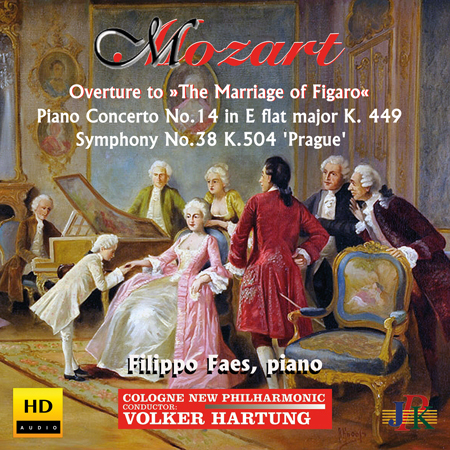 Mozart: Overture to »The Marriage of Figaro«, the Piano Concerto No. 14 in E flat major, K. 449 and his famous Symphony No. 38 'Prague' are the titles for this new Album. It consists of three works by Wolfgang Amadeus Mozart, which he wrote for his beloved public in Prague, where he celebrated his greatest success. The Cologne New Philharmonic Orchestra under the direction of Maestro Volker Hartung and Italian pianist Filippo Faes are brilliantly realizing these most beautiful master works, some of their all-time favourites.